Photo courtesy of Studer Group. Founded in 1999, the Studer Group is a private, for-profit health care consulting firm providing coaching, teaching, and evidenced-based tools and tactics to health care organizations and rural hospitals throughout the United States. Corporate offices are located in Gulf Breeze, Florida, with satellite offices in Dallas, Texas; New South Wales, New Zealand; and Queensland, Australia. Virtual home offices are located across the United States. Revenues were approximately $47 million in 2010, and the company employs 119 persons. Key innovations have helped annualized revenue grow from less than $5 million during the period 1999 to 2001 to $45 million for 2009 to 2010. Studer Group has sustained high levels of CEO satisfaction and overall satisfaction with its coaching services. Since 2006, satisfaction ratings have ranged from 4.6 to 4.9 on a 5-point scale, exceeding the Service Performance Insight (SPI) Best Benchmark of 4.3. Studer Group was named as one of the “Top 25 Best Small Companies to Work for in America” by the Society for Human Resource Management and the Great Places to Work Institute in 2008, 2009, and 2010. Studer Group’s revenues grown more than 30 percent annually since 2001, exceeding the Association of Management Consulting Firms (AMCF) average of 10 percent annual growth. Studer Group defines its success based on the results of the partners it coaches, particularly how patients perceive the quality of care they receive from these organizations. On the standardized Hospital Consumer Assessment of Healthcare Providers and Systems (HCAHPS) survey, Studer Group partners achieve two to three times greater improvement during the same time period than the national average. This results in a 20 percentile point advantage for Studer Group partners over nonpartners on measures of patient perception of care. Studer Group has been committed to providing innovative products and services since its founding in 1999. Key innovations have helped grow annualized revenue from less than $5 million during the period 1999 to 2001—when the company first offered Introduction of Nine Principles® (described as "a roadmap to help leaders navigate the journey to developing an excellence-based culture")—to $45 million for 2009 to 2010. The numerous products and services driving that growth included executive, physician, and emergency department coaching; books such as Hardwiring Excellence and the Nurse Leader Handbook; and software such as the Patient Call Manager™. Studer Group integrates its customer support system with its employee performance management processes to create a culture focused on a positive customer experience. The firm models the Evidence-Based Leadership (EBL) service excellence it teaches and identifies its key support mechanism as "people interacting with people." Studer Group's primary focus is helping its partners improve service excellence by hardwiring its EBL framework. By practicing what it teaches, Studer Group has adapted EBL to its own firm, resulting in sustained high levels of CEO satisfaction and overall satisfaction with its coaching services. Since 2006, satisfaction ratings have ranged from 4.6 to 4.9 on a 5-point scale, exceeding the Service Performance Insight (SPI) Best Benchmark of 4.3. High levels of satisfaction have translated into renewal rates that exceed 85 percent annually. Senior Leadership Surveys (SLS) from customer organizations (defined by the Studer Group as "partners") meet or exceed the SPI Best Benchmark of 4.7 "for willingness to recommend" Studer Group in 2009 and 2010. Additionally, when asked how Studer Group compares to other consultants they've worked with in terms of value and impact, senior leaders in their partner organizations rate the firm consistently above 4.5 on a 5-point scale where 5 is "very good." Overall employee satisfaction, overall employee morale, and employee engagement based on attitude surveys conducted by Sperduto & Associates reached or exceeded the 90th percentile from 2006 to 2009 when compared to other organizations in the Sperduto database. Studer Group was named as one of the "Top 25 Best Small Companies to Work for in America" by the Society for Human Resource Management and the Great Places to Work Institute in 2008, 2009, and 2010, achieving a ranking of 14th in 2010. The firm also ranked 12th on the list of "50 Best Florida Companies to Work for" by Florida Trend magazine in 2010. Studer Group uses a robust, six-step strategic planning process (SPP) to develop and deploy its strategies. A seventh step, which addresses improvements to the SPP, has resulted in the adoption of Rapid Enterprise Development to ensure linkage among strategy, people, and execution, as well as a focus on "Big Rocks"— annual goals that are the most critical to achieving Studer Group's strategic objectives. Studer Group's senior leadership has embedded EBL within the organization to provide the framework for its internal operations. Employing EBL processes supported by Studer's Leader Evaluation Manager™ (LEM) software (which tracks goals and their achievement), such as the Six Pillars and Goal Cascade, senior leaders have aligned goals, behaviors, and processes to achieve transparent communication, high performance, and workforce engagement. Senior leaders have created a culture at Studer Group that is values-driven, transparent, and fosters passion for making a difference. This is accomplished through personal modeling of values, coupled with specific "must have" tactics for selecting, engaging, empowering, and retaining workforce members. To support its key local community and the health care industry, Studer Group disseminates much of its evidence-based knowledge without charge to local organizations and the entire care community. Additionally, Studer Group offers in-kind donations of free coaching and training to local nonprofit organizations, as well as sponsorships and monetary grants for attendance at its conferences. The company's monetary and in-kind charitable donations amount to 5.1 to 6.9 percent of its net income. 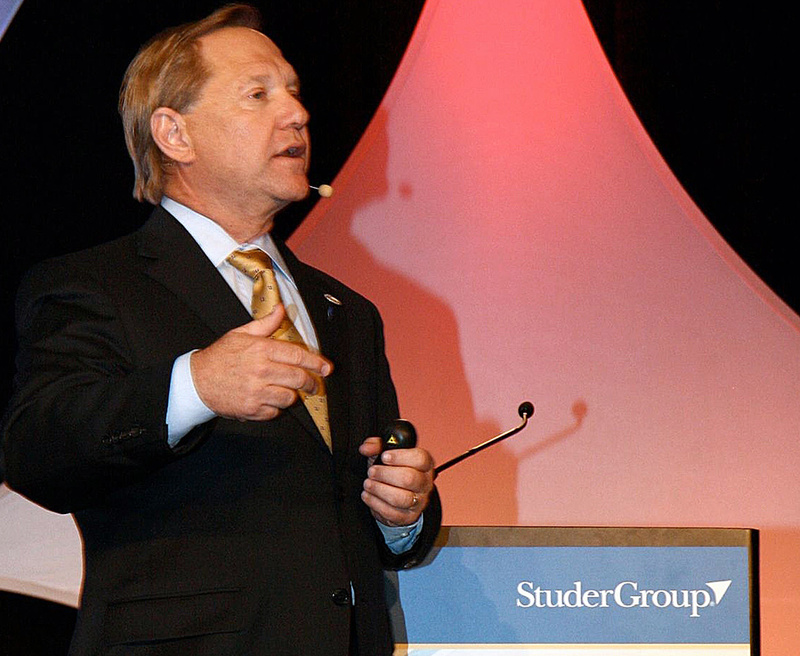 With a focus on financial sustainability, Studer Group's revenues have grown more than 30 percent annually since 2001, exceeding the Association of Management Consulting Firms (AMCF) average of 10 percent annual growth. Studer Group's active contracts with health care organizations have steadily increased from 2006 to 2009 for both segments of its coaching business: general acute-care hospitals and rural hospitals. The firm's average annual contract growth rate of 18 percent consistently outperformed the AMCF average of 5.5 percent.